What are we willing to die for in the age of Donald Trump? This was the overarching question that repeatedly came to mind Tuesday afternoon as I listened to an impressive panel of journalists, former and current athletes celebrate the launch of the Institute for the Study of Sport, Society and Social Change at San Jose State University. The Institute is the creation of Harry Edwards, professor emeritus at the university and a renowned sociologist who is most associated with the study of political activism in sports beginning in the late 1960s. A nearly full house at the Hammer Theatre heard a fascinating array of perspectives, from Jim Brown explaining why he met with then-President-elect Donald Trump, Chris Webber discussing the exploitation of young athletes, Kareem Abdul-Jabbar calling for economic cooperation among athletes, and Takeo Spikes and Anquan Boldin explaining why they played the violent game of football. The overarching theme of the conference was Words to Power and what are we willing to risk. My question after all the words and all the applause was what are we willing to risk. What in 2017, with so many African-Americans doing well, are we willing to die for? Not necessarily a literal death, but career death, economic death or political death that comes with actively resisting. “The issue of what I am willing die for at this point is simply the reverse side of what is it that I am fighting for in life,” Edwards said. Edwards, who turns 75 in November, reconsidered the question of what he would die for and referenced his two grandchildren, ages 3 and 1 1/2. “What makes me more committed than ever is making sure that the world that I leave them is the best possible world that I can help to create,” he said. “In that process, I lose my house, I lose my money, I lose my life, that’s the price that has to be paid. What I hope it will do is facilitate a plan of action for African-Americans gaining power and control in an industry which, in many ways, is there for the taking except for lack of unity and cohesion. During an hourlong panel discussion, the need for unity and concerted action came up several times and was expressed in a number of ways. Achieving that unity has been elusive, except in team locker rooms, where athletes are trained to put aside differences that hinder the pursuit of a common goal. In many ways, the negative reaction to Brown’s meeting with Trump is emblematic of the dilemma of a team — the Black Team — moving forward. Abdul-Jabbar, like Brown, supported Hillary Clinton. Unlike Brown, Abdul-Jabbar has been a vocal critic of Trump and could not bring himself to meet with him. But there they were, side by side on stage, respectful, cognizant of the mission at hand: how to move beyond words into action. Leaders and legends meet to discuss sports activism during the launch event for Institute for the Study of Sport, Society and Social Change. The object of Tuesday’s summit, and perhaps the signature of Edwards’ new institute, will be the creation of a veritable locker room space that will accommodate wide-ranging, far-reaching opinions. Perhaps it will also help answer the question: What does it mean to be an African-American and an African-American athlete in the age of Trump? This was my first time seeing Brown since he took the meeting with Trump shortly after he was elected president. After the panel, I asked Brown about that decision, and more pointedly, how do each of us, as African-Americans, avoid being water boys and water girls for white interests. How do each of us avoid being the person white folks point to as they attempt to deflect charges of racism? Flippantly, I replied that I didn’t have any white friends. First, that was not true. Secondly, he did not say friends. He was asking who had helped me get to this point in my life. In fact, they have been an all-star cast of races, creeds and colors and of all political persuasions, some I liked, some not. That was Brown’s point and this was the honest dialogue. Brown, who operates the Amer-I-Can program, said that he wasn’t looking at black and white when he accepted the meeting. He was looking at power and access. “While other people were sitting on their butts complaining, I was putting together a plan, so if I had an opportunity to talk to these people, I could solicit them to buy into my concept. They haven’t asked me to buy into any concept. They know that I voted for Hillary but they are willing to work with me because I brought something to them that made sense,” Brown said. “We need jobs, badly,” Brown added. “We need to continue education, badly. We need to eradicate the violence, badly. That does not have a lot to do with Trump, it has to do with all of us. The Institute for the Study of Sport is only the latest university-based think tank created to study issues related to the explosive field of sport and play. The study of racism and sport has become a new cottage industry. Institutes have been created throughout the United States. They tend to look at statistics, at how many women or how many African-Americans are in this position or that position. The institutes tend to focus on how to develop better education classes in areas such as sport and gender. Like the sports industry itself, the institutes also tend to be run and operated by non-African-Americans. 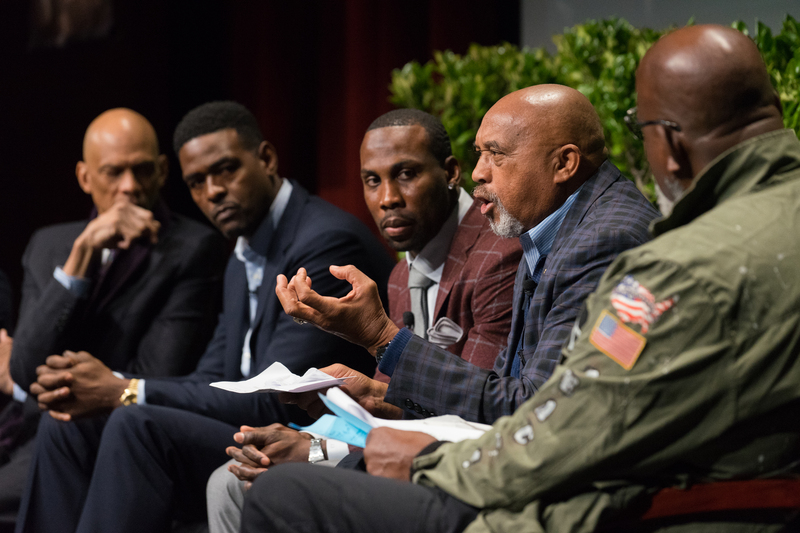 “We want to look at how sports interfaces with issues, structures, processes and dynamics in society to contribute to, if not create, social change,” Edwards said after Tuesday’s event. Edwards was among the first scholars to chart how the evolution of African-Americans in sport has mirrored the evolution of African-Americans in society — from being locked out to being begrudgingly allowed in to demanding respect to changing how games are played to using the visibility of sport and the money generated by sports to create an unprecedented dynamic. We have witnessed the phenomenon of athletes on professional sports teams joining protests outside of the arena, college athletes adding their voices to student protests, demanding airtime on networks to make statements. The black presence in sports is becoming an organized power surge. San Jose State is the university that produced John Carlos and Tommie Smith, whose demonstration at the 1968 Mexico City Games remains the most iconic image of protest in sport history. Carlos and Smith are on the institute’s advisory board. “This is what will distinguish this institute from all of the others that are counting bodies, doing things about developing classes on gender, sport and social issues in the university,” Edwards said. “We will be specifically looking at how, why and what are the dynamics, what are the projected outcomes of these developments at the interface of sport society and social change. My concern with these institutes is that they often forge affiliations with sports leagues and teams, which they advise [and grade] — on issues of diversity. How harshly will you grade an organization that is funding your center to the tune of millions of dollars per year? If you are a paid consultant to a team, is your role to get to the root of player uprising or to quell them. Are you a consultant or are you a management spy. As we wrapped up our conversation Tuesday evening, Edwards said that, among other things, he wanted the institute to facilitate the convergence of a powerful black sports presence with the ongoing struggle for African-American survival and prosperity. They are, in fact, intertwined. To make his point, Edwards recited a stunning statistic: “From 1882 until the end of 1968, the United States averaged 40 lynchings of black people every year,” he said. “From 2000 to 2015, the country has averaged 147 police shootings of black people every year, most of them unarmed. 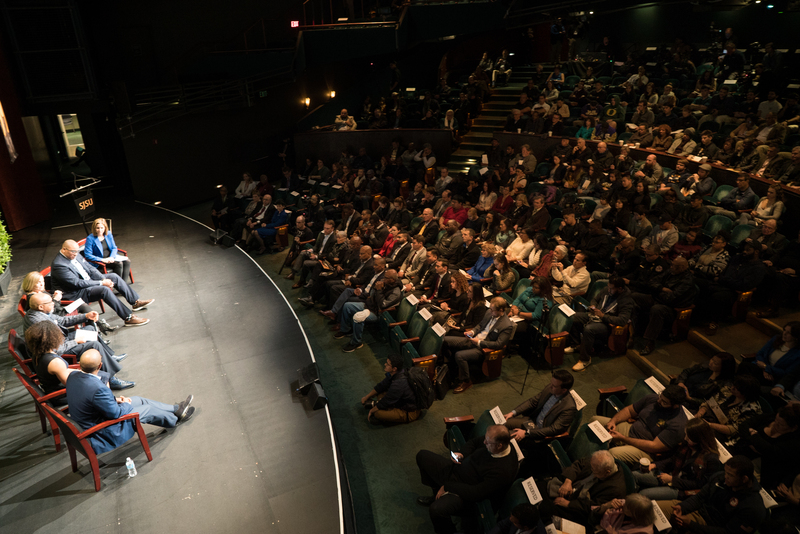 Tuesday’s event was ceremonial and only the beginning, a star-studded cast of athletes and scholars called together to make the point that the struggle continues and athletes’ informed voices are more critical now than ever. The theme of Tuesday’s inaugural event, indeed the imprimatur of Edwards’ Institute for the Study of Sport, Society and Social Change, is transforming words into power. Never has there been a more important imperative.